The Sicán abandoned the old center of their civilisation at Batán Grande and relocated to the current site of Túcume. 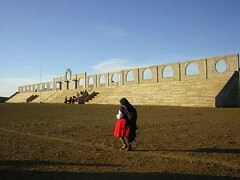 Built entirely of adobe mud bricks between 1000-1100 AD, the site flourished for nearly a milenia under Sicán, Chimú and Inca rule until the arrival of the Spanish in 1532. Spread over more than 220 hectares, there are 26 enormous pyramids standing in ruins. At the centre of their new city is the mountain of La Raya, from which you can survey the valley below. The pyramids lay in ruins, destroyed by heavy rains brought by the El Niño phenomenon. These were once perfectly formed stepped-pyramids decorated on the outside. There existed different platforms and pyramids for different religious and administrative purposes. The site is in a particularly arid part of the Lambayeque valley made green by a canal 43-miles long constructed at the same time as Túcume. The now-fertile agricultural land allowed the Sicán to flourish in their new city. There are pyramids built off along the valley, but the main complex has its focus around the northern side of La Raya. 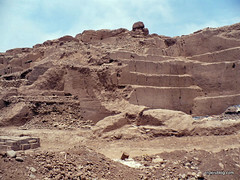 Archaeological work goes on continuously, mostly on the structure named Huaca Larga. Unfortunately, this, the most interesting structure, is off-limits, so are the best finds in the site. Visitors can see what was found in the site museum, walk around two defined paths and climb La Raya. Cabello de Balboa, recorded the legends of the the peoples of the Lambayeque region in 1586. He was told be Sicán descendents that the grandson of God-King Naymlap set out to build new settlements in the Túcume area after the culture mysteriously burned down their capital in the Pomac forest at Batán Grande. In the mid 1000s AD Túcume was founded and growing. When the Chimú arrived around 1350 AD they found a great city – and conquered it. 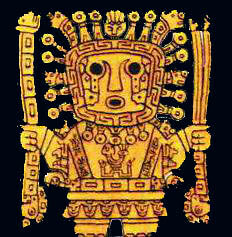 While part of the Chimú empire, signs of their rule of the complex can be found in Chimú pottery designs. When the Incas conquered the Chimú, Túcume still remained a power centre. The regional Inca governor was buried there in a lavish grave. 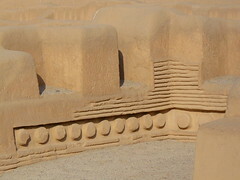 The Huaca Larga is off-limits to visitors but it the largest most interesting off all the huacas. It is formed by a pyramid and a large platform extending before it – the longest discovered in Peru at about 700m in length. 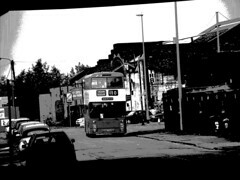 How it looked originally, no-one knows. When the Chimú arrived on the scene in 1350 AD it was heavily remodelled. 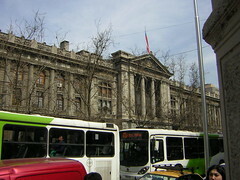 Under Chimú rule all buildings were red, white and black – or covered in Chimú style sea-birds reliefs. The Huaca was effectively remodelled to look like Chan Chan in the south, with its high walls, long corridors and room-partitioning. In Inca times, numerous burials were conducted in the Huaca Larga. Weaving and textile production was performed there, and 19 high-status female Inca weavers were buried there with their best equiptment. Elsewhere in this construction, the regional Inca Governer was buried with all his Inca regala and insignias. What is known as Huaca 1, was 30 metres high, a stepped pyramid with a narrow ramped leading to its truncated top, where a series of rooms housed the Sicán elite. Its walls wer remodelled by the Chimú, who prefered sea-bird friezes like those seen in Chan Chan. The Temple of the Sacred Stone is a U-shaped templed in which stands a large boulder. It is the though to have been the most important temple of the site, and all who entered the city of Túcume had to pass through it due to its central location and a walled roadway that lead from the valley to the Huaca Larga passing through it. What this stone was for, no-one knows, but hundreds of offerings were found here, from Spondylus shells, sacrificed llamas and metal ornaments. Even the Incas considered the site important, leaving silver figurines and feather headdresses. It is with some irony, the most heavily damaged huaca, by weather and looters, also revealed the most preserved discovery at Túcume. The Huaca Balsa has the best preserved high-relief friezes in the region, the most important being the Frieze of the Rafts, which may depict the moment when mysterious Naymlap arrived in the regions after the collapse of the Moche, rebuilding civilisation. It shows a bird-man arriving on a raft, followed by another more people. Another frieze depicts a priest in a temple holding a staff in one hand and a llama in the other. Although disappointing in that you are not allowed to see any of these interesting finds at Túcume, the site is amazing when seen from the lookout on La Raya.